Sub-Division 4 or the Suppression Sub-Division of Offense about the Consumer Protection ( Kor Kor. 4 Bor Kor. Por Khor Bor.) has authority, duties and responsibility about peace and order keeping, prevention and suppression of crimes concerning food and drugs and other related offense in its responsible area, including joint operation with or support the operations of other organizations which are related or assigned. Hazardous Substances Act, B.E. 2535 (1992). General Staff Affair engages in the duties and responsibilities of its administration work consisting of administration , documentation and records, personnel administration, legal affairs, legal case proceeding or litigation and disciplinary code, policy and planning affairs, strategic operation, financial and accounting affairs, budgeting affair, logistics, welfares provision, staff assisting and clerical or secretarial affairs, information technological and communications affairs, public relations and information disseminations affairs, educational and training affairs and intelligence affairs. Operation Team 1 is responsible for area of Bangkok Metropolis, Metropolitan Police Division 3, 4 and the area outside Bangkok in the responsible area of Provincial Police Region 3, 8, 9 and the Southern Border Provinces Police Operation Center (SBPPPC or Sor Chor Tor). Operation Team 2 is responsible for area of Bangkok Metropolitan Police Division 1 and 2, and the area outside Bangkok in the responsible area of Provincial Police Region 2 and 4. 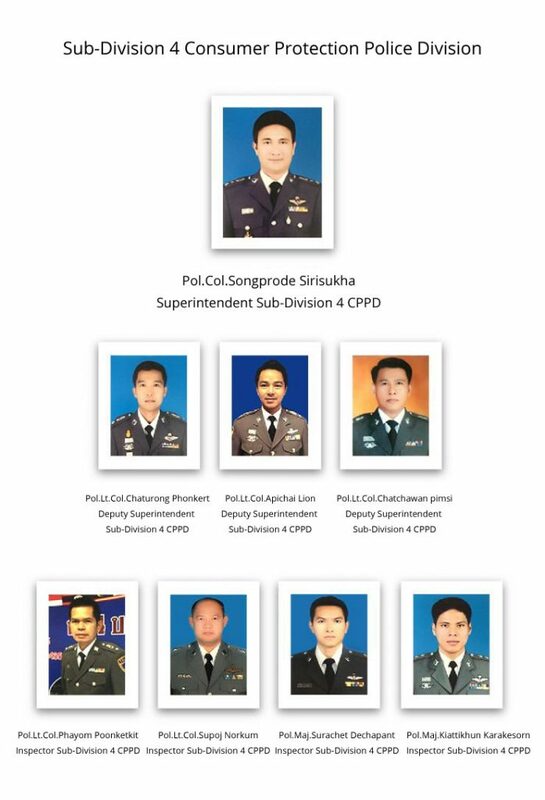 Operation Team 3 is responsible for area of Bangkok Metropolitan Police Division 5 and 6, and the area outside Bangkok in the responsible area of Provincial Police Region 1 and 7 and the Southern Border Provinces Police Operation Center (SBPPPC or Sor Chor Tor). Operation Team 4 is responsible for area of Bangkok Metropolitan Police Division 7, 8 and 9, and the area outside Bangkok in the responsible area of Provincial Police Region 5 and 6. Inquiry Affair The organization has authorities, duties and responsibilities about how to comply with the Criminal Procedure Code of Thailand, to investigate, inquire on offenses punishable criminally according to food and drugs or criminal offenses according to other related offenses all over the Kingdom of Thailand, including the joint operations with or support the other units which are related or assigned. To patrol and inspect various assigned areas, if the offense in pursuant to the responsible Acts is found, the police officer has power to arrest the offender to be proceeded in the legal case and bring such offender or alleged offender to the Inquiry Officer of the Sub-Division 4, CPPD to proceed the legal procedure further. The proceeding of the legal procedure to the responsible area officer or the Sub-Division 4, CPPD shall consider from the important and related case which shall be submitted to the Inquiry Officer of Sub-Division 4, CPPD. But the petty case or little offense or case with few exhibit, most of them would be submitted to the responsible area inquiry officer to proceed the legal action.